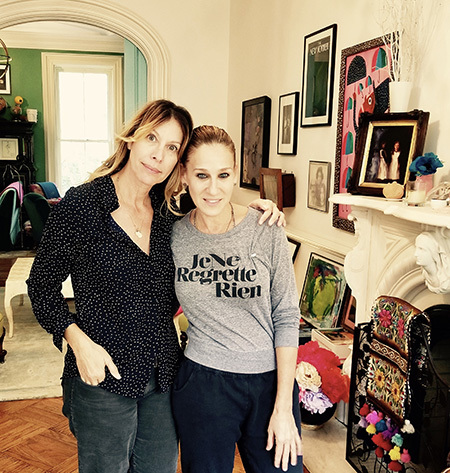 Ilana Levine (left) with actor Sarah Jessica Parker. In the musical You’re a Good Man, Charlie Brown, Lucy sings a song called “Little Known Facts” in which she posits, among other things, that fir trees are so named because they provide “fur for coats.” When Ilana Levine, who played Lucy in the 1999 Broadway revival, began a podcast interviewing colleagues who inspire her, she named it for her character’s signature tune. The title seems inevitable now, but she only settled on it after recording an interview with fellow Charlie Brown cast members Anthony Rapp, B.D. Wong and Kristin Chenoweth before the official launch of the podcast in May 2016. Every Tuesday, Levine posts a new 45-minute episode of Little Known Facts with Ilana Levine, which she described as “unfiltered, raw, honest and uniquely funny interviews with artists you love as they talk about the art they love to make.” As well-connected as she is—Levine has recorded over 100 interviews so far—she isn’t immune to the excitement of sitting across the table from an icon. Although Levine’s guests are not exclusively Jewish, she explores an artist’s relationship with Judaism when appropriate. Married couple Sarah Jessica Parker and Matthew Broderick, each with one Jewish parent, discussed with her how important it was for both of them to marry someone with a Jewish background. And then there’s Alda, born Alphonso D’Abruzzo. His wife, Arlene, is Jewish and he strongly suspects his family was originally Jewish, too. “My grandfather told me when I was a boy that 450 years earlier the family had come from Spain, which would have put it around 1492,” Alda told Levine. “So my guess is the family was Jewish, because that was the year of the expulsion. “In Italy,” he continued, “if you’re named after a region or a town, the odds are two to one that you’re Jewish,” because Jews who settled in a town often took the town’s name as their surname. And D’Abruzzo means from Abruzzo. If Lucy is famous for her brash, pull-away-the-football personality, Levine is soft-spoken, engaging and good-humored. She grew up in Teaneck, N.J., where her family attended a Conservative synagogue and her mother was president of her local Hadassah chapter. Today, Levine lives in Brooklyn with her husband of 15 years, actor Dominic Fumusa, who converted to Judaism, and their two children. Levine handpicks guests who use their celebrity to do good in the world. She also highlights charitable organizations they’re passionate about, such as The Trevor Project, which focuses on suicide prevention in the LGBTQ community (Matthew Broderick), and Artists Striving to End Poverty (actress Laura Benanti). She also has mentioned the Jewish National Fund, which Levine said she has supported since she trick-or-treated with her little blue pushke. “Those are the values I learned going to Tel Yehudah in Barryville, N.Y,” she said, referring to the Young Judaea overnight camp. Levine considers podcasting an extension of her acting, which is still going strong. Having jumped into a second career, she hopes her personal journey will speak to her listeners. Below is a taste of the broad range of topics Jews are discussing on various podcasts. In Heavyweight, Jonathan Goldstein of This American Life investigates seminal moments in the lives of friends and family, infusing them with a wry, Jewish sensibility. Tablet Magazine’s UnOrthodox pairs a Jewish guest with a non-Jewish one in each episode, offering commentary on news and culture. For example, one episode featured Jewish comedian Judy Gold with Jesuit priest James Martin. Israel Story narrates fascinating tales of the diverse people of Israel. A recent episode looked at the country’s most iconic tunes. The Branch: Stories About Building Connections Between Jews and Arabs, presented by Hadassah, The Women’s Zionist Organization of America, launches this July. The podcast is about a shared society, real tales of Israel’s Jews and Arabs connecting and working together—even though it’s complicated. The first few episodes will feature a theater with bilingual productions, a school that integrates Jewish and Arab students, and a look inside the multicultural halls of Hadassah Hospital. Joanne Sydney Lessner is the author of the novel Pandora’s Bottle and also writes reviews and features for Opera News and ZEALnyc.